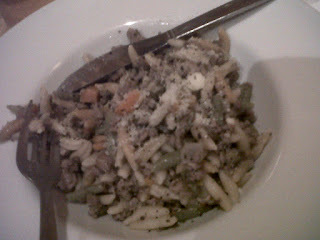 A food blog covering restaurant reviews, eating out, recipes and food writing. Now in London. The other half has been coming to Newcastle long before venturing up here for University, and therefore has always had some good tips on local eateries and places to go to. Panis Cafe has long been one of our favourites, and has been recommended and become the staple go-to place for all our friends. We had our first date, 1 year anniversary here, been for numerous friends birthdays, and family get togethers, so last Monday when it was my friends birthday, and she had somehow forgotten to plan anything, we all knew where we were going to end up. As soon as you step inside you can tell this isn't the run of the mill business like Italian, the inside is cave like and looks like a literal interpretation of the inside of Gaudi's head. Think terracotta swirling paint, and ornamental alcoves. The food here has always been good, however on this trip the menu had changed slightly, and I had a worry by favourite dish might have been taken off - that's the issue when you know a place so well and it starts change. I had a lovely evening celebrating my friends birthday but there were definitely some faults with this place. The food was as good as ever but portion sizes seemed to have been slimmed down like the menu, and the room was also uncomfortably warm, and having ordered a sausage casserole the heat almost made me regret my choice. I am a major stickler for good service, in a place such as Panis where the atmosphere is supposed to be that of a friendly, family run independent restaurant, you would expect the service to match up. Here it faltered on many occasions, one woman who served us was efficient but somewhat short, the male waiter was sullen and moody looking. The other half and I arrived after the rest of our group but at no point were we asked if we wanted drinks until our food order was taken, there was no complimentary bread offered although other tables appeared to have it and I know it is usually the policy, and to top it off whilst most of us had our dinners the other half waited 10 minutes after everyone else, ask numerous people before his dinner was brought without so much as an apology. But the food was up to standard, as we have all been before favourite dishes appear to have emerged and I wasn't the only one who had pre decided on the Casserole Salsicee. This is a proper Italian sausage casserole, I come back to it time and time again, it was perfect for the wintery, rainy Monday night we were out on providing my ultimate comfort food. The sausages are a cross between a cured meat sausage like a large chorizo and a english sausage. 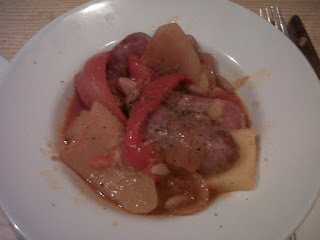 I want to know where I can buy sausages like this so I can recreate it at home, it comes with potatoes, polenta, onions, borlotti beans, and peppers in a hearty tomato sauce. At £8.20, it's very reasonably priced. That is one of the plus points at Panis, even with the shrink in meal sizes, it has never seemed overpriced. 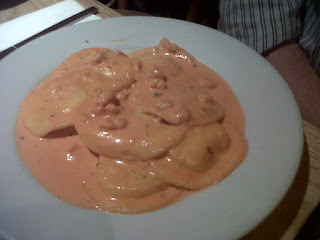 A few others got my other favourite dish, the ravioli all'aragosta, ravioli pasta parcels filled with ricotta and lobster with a creamy tomato and prawn sauce. This sounds like it would be very rich, but it is balanced beautifully, velvety smooth and always met with pleasure. Again £8.20, very good. The other half thought he'd try something new, and we have been quite fixated with rabbit and the like recently so went for the Game Ragu and once it finally arrived he admitted it looked less that appealing, but I have his word it was rustic and peppery although perhaps a bit dry (it does look it doesn't it). It's served on a traditional Sicilian type of pasta, malloreddus which is slightly denser than other types of pasta. Panis is still somewhere I would return to, even with my grumbles about the service because food like this, which tastes authentically Italian is hard to find in Newcastle, which is awash with frankly awful Italians (I went to Sale Pepe to meet some friends the other night, prime example of this bargain brand of bad food) but then so is every city. For over £10 you can get sea bass fillets on squid ink pasta and rump steak with prawns in garlic, parsley butter. They also do fantastic chips, my attempt at a diet meant I resisted the option. The main thing I find so surprising about this place, is that so few people have been or even know it exists. Tucked up a side street near the Theatre Royal, it isn't even out of the way - make a lunch trip and perhaps ignore the service. No tip was left. 'To eat is to appropriate by destruction', Sartre. Restaurant reviews, recipes and unsubstantiated comments about eating. All copyright owned by milked.teeth.. Powered by Blogger.